The Indianapolis MPO receives an annual allocation of federal funds and operates a program to select projects to fund with federal money. We use existing plans, direction from the IRTC Policy Committee, and public input to select projects that provide Central Indiana with the highest regional transportation benefit. Create Scorecards. 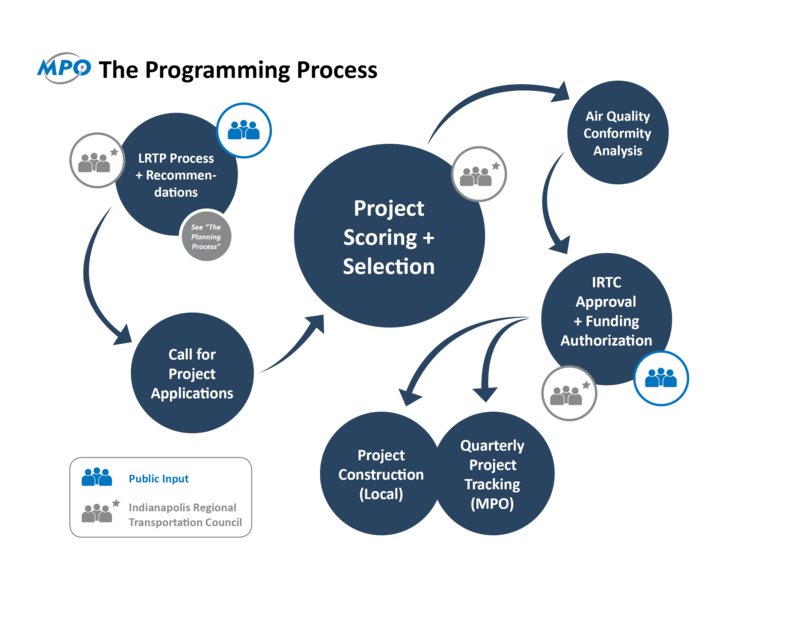 We use best practices, federal guidelines, and IRTC input, determine the best scorecard for each funding category. Call for Projects. We announce a call for projects to IRTC members, provide an outline of money available for the funding call, and a deadline. Review submitted projects. Towns, cities, and counties all submit projects for funding; they self-score their projects. We double-check the scoring and rank/recommend projects based on their score. Public Comment. The IRTC and public provide input on the list of recommended projects. Seek Approval. We put a final list together and submit to the IRTC for final approval. Track Projects. Every project is tracked to ensure the project meets its deadlines and will be able to spend its allocated money. Check out MiTIP for the current list of projects.